This magnificent Bedat & Co. No. 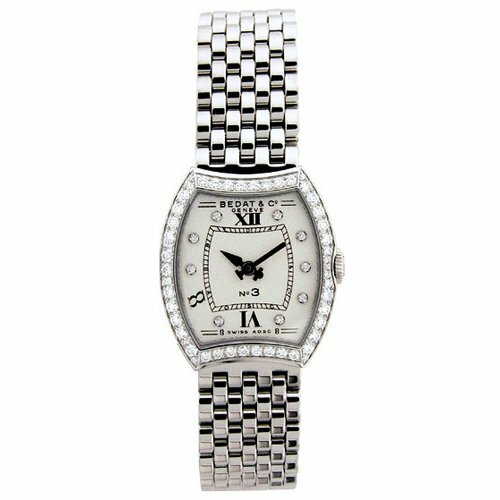 2 Stainless Steel & Diamond Ladies Luxury Watch Model # 306.333.109 / 306-333-109 will make a perfect gift, or a great addition to your collection. A Bedat No. 2 Swiss timepiece especially designed to be majestic and precise in movement. 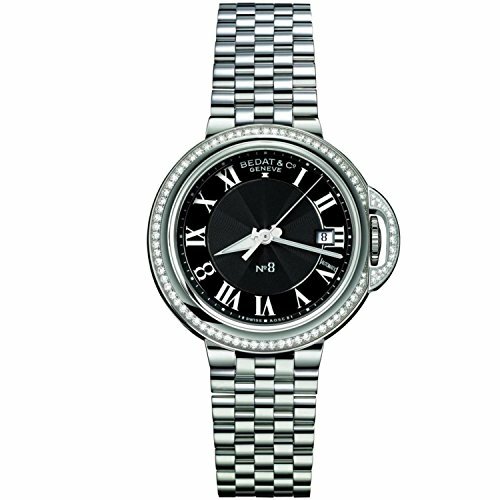 A sophisticated stainless steel and diamond ladies watch created to rest elegantly around the wrist features a handsome Silver sunburst dial set with blued steel hand indicators, Black Roman Numeral hour markers. 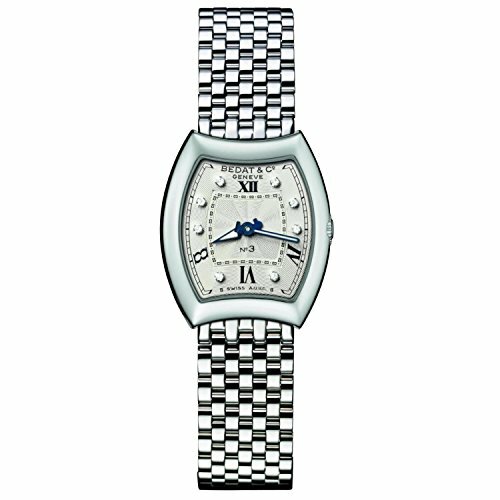 Presented in a luxurious Polished stainless steel case and Bedat's signature 'Mille mailles' Bracelet - An extremely comfortable wear, Inner bezel set with 59 diamonds (approximately 0.52 carats), A superior Scratch Resistant Sapphire Crystal protects the dial, Stainless Steel Solid Case back, Precise Swiss Quartz movement, Water resistant to 50 meters/165 feet. 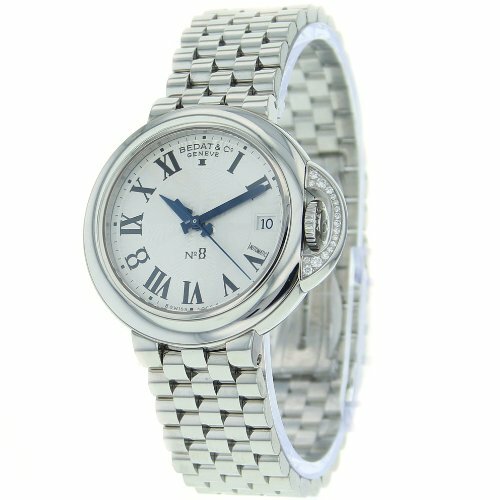 As all of our other watches, this Bedat No.2 ladies watch is brand new and comes with the original box, warranty card and papers! 18kt white gold case with a black grosgrain fabric strap. Fixed 18kt white gold set with 30 baguette diamonds bezel. 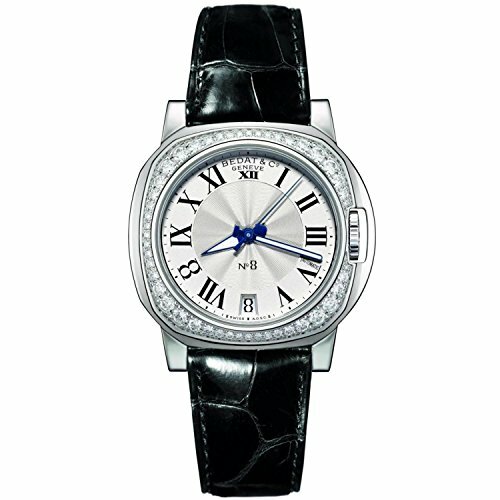 White dial with silver-tone hands and Roman numeral hour markers. Dial Type: Analog. Quartz movement. Scratch resistant sapphire crystal. Solid case back. Case size: 30 mm. Tonneau case shape. Tang clasp. Water resistant at 30 meters / 100 feet. Functions: hour, minute. Luxury watch style. Watch label: Swiss Made. Bedat No. 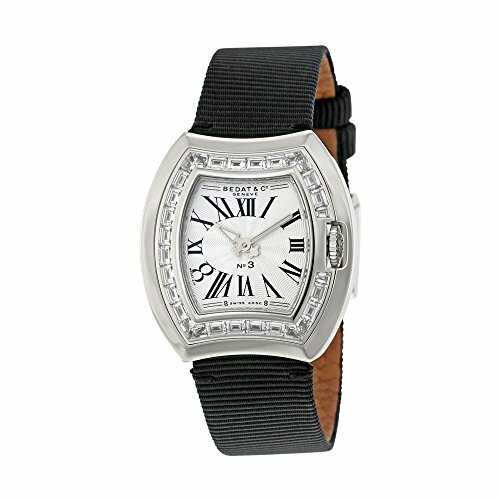 3 White Dial Black Fabric Diamond Ladies Watch 324.550.100. Stainless steel case with a stainless steel bracelet. Fixed stainless steel bezel set with 102 diamonds. Silver dial with blue hands and Roman numeral hour markers. Dial Type: Analog. Quartz movement. Scratch resistant sapphire crystal. Push / pull crown. Solid case back. Case diameter: 36.5 mm. Round case shape. Hidden folding clasp. Water resistant at 50 meters / 165 feet. Functions: hour, minute. Luxury watch style. Watch label: Swiss Made. 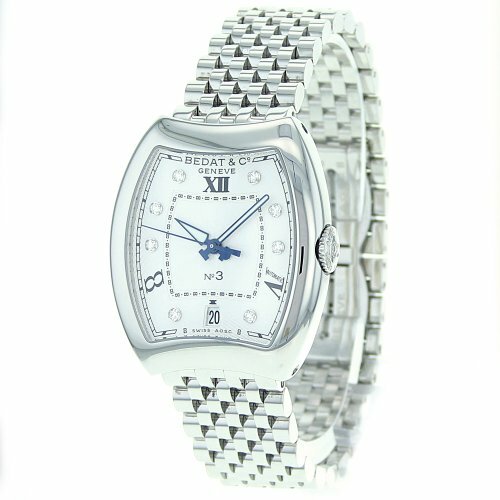 Bedat No 2 Silver Dial Stainless Steel Diamond Unisex Watch 228.031.600. Stainless steel case with a red leather strap. Fixed stainless steel bezel set with 173 diamonds. Silver dial with blue steel hands and Roman numeral hour markers. Minute markers around the outer rim. Date display appears at the 3 o'clock position. Automatic movement. Scratch resistant sapphire crystal. Solid case back. Case dimensions: 28 mm x 31 mm. Tang clasp. Water resistant at 50 meters/ 165 feet. Functions: hours, minutes, seconds, calendar. 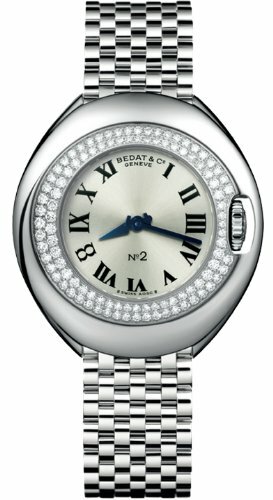 Bedat No 3 Silver Dial Diamond Bezel Ladies Watch 314.050.100. 828.021.600 Features: -Case material: Stainless steel.-Bracelet material: Stainless steel.-Automatic movement.-Scratch resistant sapphire.-Water resistant up to 5 ATM.-Sapphire crystal.-5 ATM/50 meters/165 feet.-Case Diameter: 40mm. Color/Finish: -Dial color: White. Dimensions: -Case Thickness: 17mm.-Overall: 7'' H x 5'' W, 0.5 lb. Collection: -Classic collection. 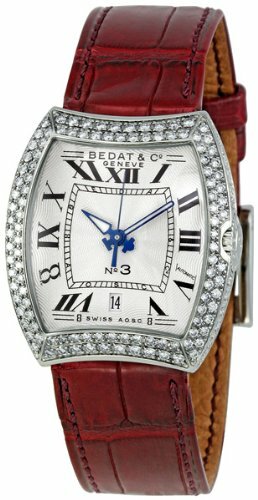 Compare prices on Bedat Diamond Watch at ShopPlanetUp.com – use promo codes and coupons for best offers and deals. We work hard to get you amazing deals and collect all available offers online and represent it in one place for the customers. Now our visitors can leverage benefits of big brands and heavy discounts available for that day and for famous brands.